We enjoyed a very warm week in the Meadowgarten, with the children asking when we will start swimming in the creek! We have enjoyed observing the signs of spring all over the school grounds. 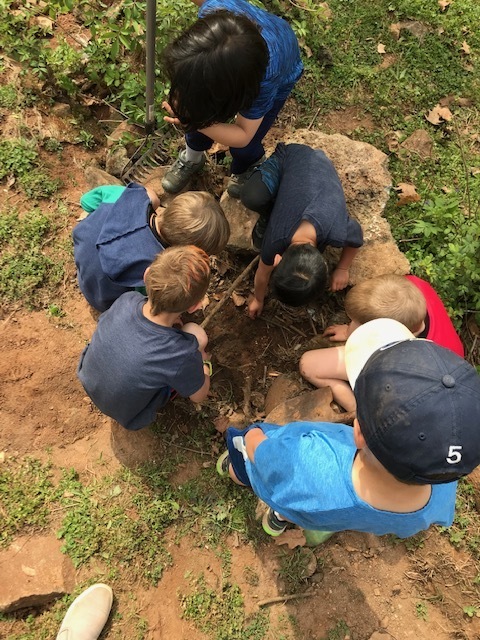 The ducks have returned to the pond and wetlands, there is a bird nest with baby birds in the garden, and the vegetable garden is growing and growing before our eyes. We planted a small herb garden of our own, starting with spearmint and basil and we will plant more seeds next week. We look forward to using the mint in iced herbal tea to enjoy during snack time. This was our second week sharing soup with our Joyful Beginnings friends and we are so happy that they are able to be with us. Ki Ieva gave us some radishes from their garden and the children enjoyed the fresh, crisp and spicy taste. On Tuesday, Ki Holly made some dough for the children to practice kneading. She took the extra dough home and cooked mini tortillas for everyone to try on Wednesday as part of our snack. They were very yummy! On Thursday, we enjoyed a wonderful Creature Feature. We met sweet Norbo, a K-9 working with the Cobb County Police. We learned that he works hard to ensure that stadiums and other public places are safe by sniffing for explosives. Norbo understands very well when he is working and when he is playing. When he has his police vest on, he is working and when the vest is off, he is like any other dog, wanting to chew his toy and have his ears scratched. All of the students were able to pet Norbo and they loved the experience! 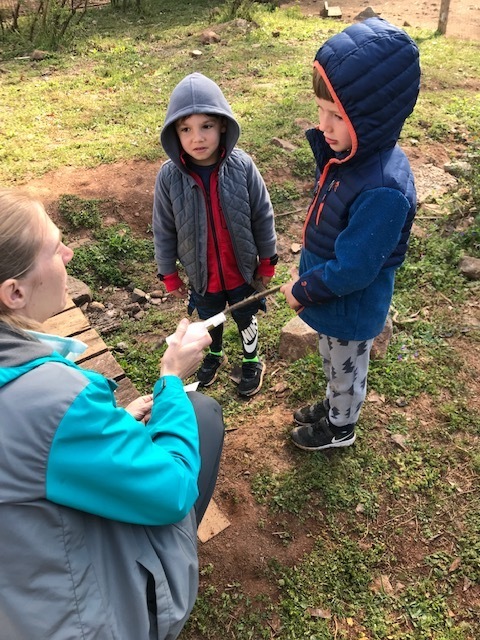 On Friday, even though it was warm, we made a fire in the forest so that we could pop some popcorn for our snack, which we enjoyed with sweet, juicy apples. 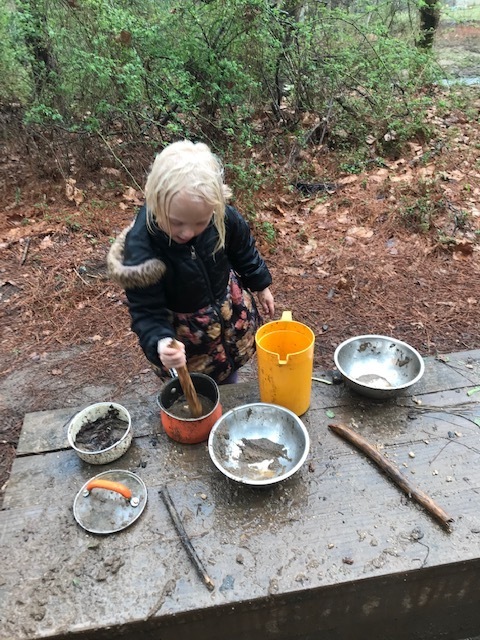 In the forest the children played tag, made beautiful and fun creations in the mud kitchen and the sandbox, collected nature treasures and climbed trees. Inside play was fun too, dressing up with silks and balancing on our new sensory pads, giving to us by Ki Melissa. Along with all of the beautiful signs of Spring, we are also noticing the return of mosquitoes. Please send bug spray to school with your child. Also, the sun is getting warmer so please apply sunscreen to your child prior to school. We can help them reapply as necessary, especially since the sun is warmest in the afternoon. We had an eventful and exciting week this past week! 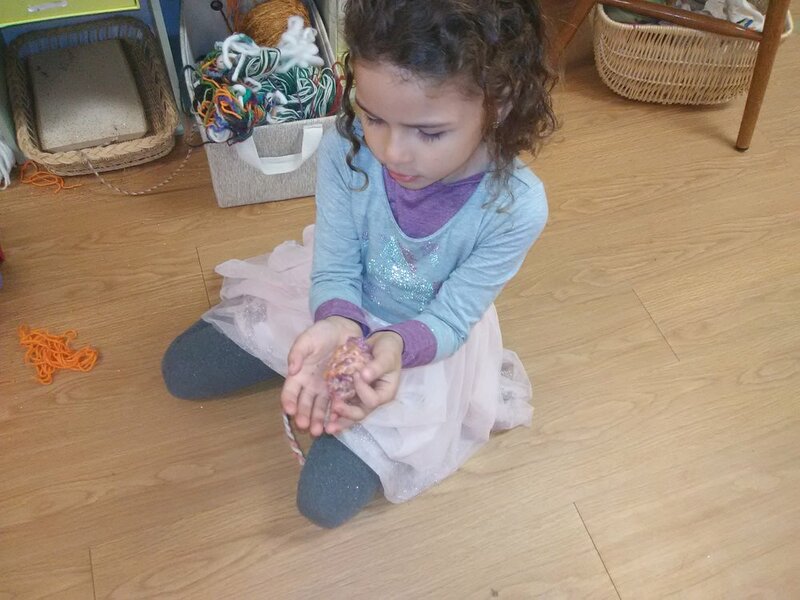 The children enjoyed holding the soft baby chicks in their hands and looking at their different colors and feathers. In the garden we planted herbs, smelled the newly bloomed lavender, and had to seek shelter under the gazebo during Spanish one day as the sky opened and poured rain upon us! We also got to admire the lovely radishes Ki Ieva and Joyful Beginnings planted, they kindly gifted two to our class. 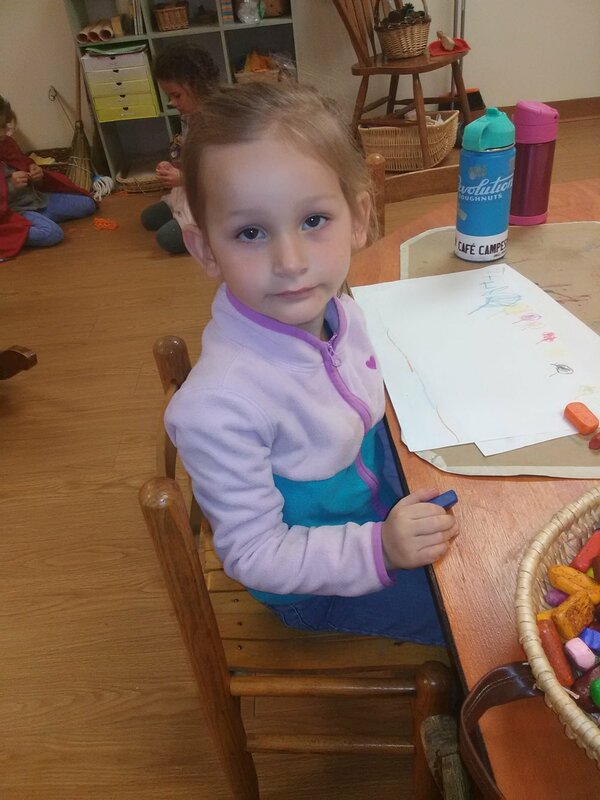 Thank you Ieva and Joyful Beginnings! In the forest we also enjoyed making leaf crowns, spotting the turtles sunbathing on top of the logs in the lake, and climbing on top of the Trojan horse. We also had our last creature feature of the school year- a cob county bomb dog! The kids loved petting him and watching him chew up his toy. Thanks to the police officer Elijah who brought him in and for answering all our questions! A special thanks to Sarah Darby and all who helped out during the Springtide festival on Saturday. What a beautiful festival it was. As sunny days are up ahead, please apply sunscreen on your child prior to coming to school! We are planning to jump in the creek this week so make sure your child comes to school with a swimsuit and change of clothes as well! We hope that everyone had a restful and rejuvenating Spring Break. It is hard to believe that spring time is already upon us. 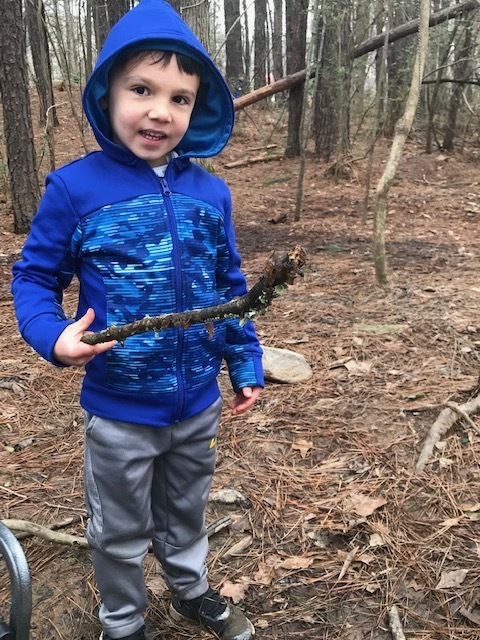 The Meadowgarteners have enjoyed observing the signs of spring, such as flowers blooming, birds chirping, turtles basking in sun on logs in the pond, ducks returning to the wetlands, and dandelions and onion grass sprouting everywhere! The week before Spring Break was yet another week with wintery mornings and warm afternoons. We practiced nailing some nails into boards of wood. The children greatly enjoyed this. 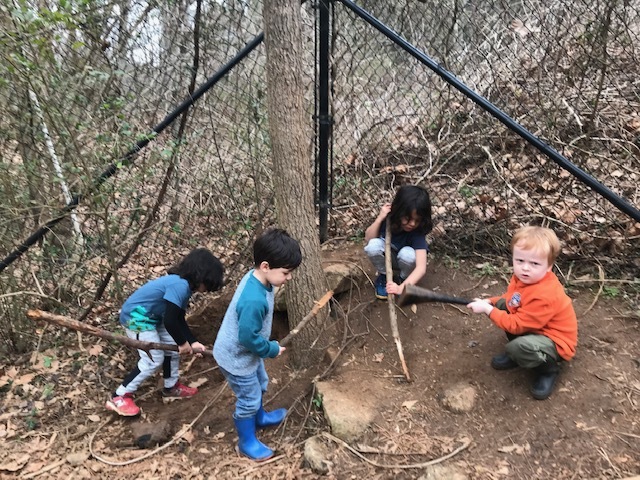 We will keep practicing our hammering skills so that we can work toward a craft involving nails and wood and also to help the upper graders frame out the tree house in the forest. We are continuing to work on our finger knitting skills and it is so exciting to see many of the children really getting the hang of it! They are working very hard and several students have already made bracelets and necklaces. 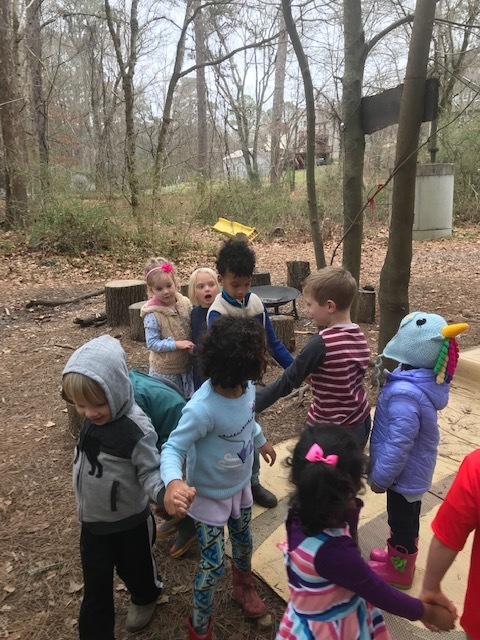 On Thursday, our Joyful Beginnings friends met us in the forest for our soup snack. We look forward to having snack with them every Thursday for the rest of the school year! Lunch time has also been fun, as we continue to eat outside in the meadow. We will be adding a new song to our Morning Circle when we return from break. We are looking forward to seeing all of the students bright and early Monday morning! Warm spring greetings! We hope everyone had a wonderful and relaxing spring break. We are happy to have the children back and swing into our spring rythm! We have a couple of new Spring songs to introduce and we are excited to see what has grown in the garden while we’ve been away. The week before spring break went very smoothly, we said good bye to the last of our chilly mornings and enjoyed the warming days. The children listened to a story about a brother and sister who went for an adventure at night in a makeshift raft, got stranded in the middle of the lake, and were rescued by a family of lightning bugs, a little bird, and a friendly alligator. We celebrated Ezra and Lounes’s sixth birthday. We enjoyed hearing their stories growing up together as well as the delicious berries with coconut cream- thank you Christine! There’s already been mosquito sitings so please start spraying the children with repellent before they come to school. 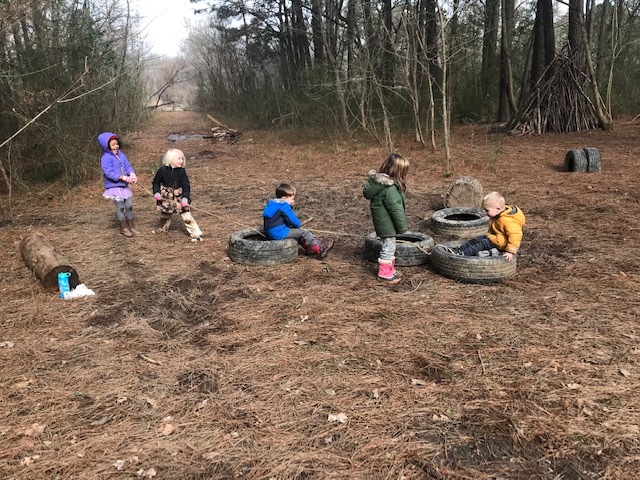 Last week in the Meadowgarten, we enjoyed brisk mornings with fires and warm afternoons where jackets were shed and students actually complained it was “toooooo hot!” Toward the end of the week, some of the puddles and mud finally started to dry out in the forest. We spent about half our outside time in the forest and the other half in the garden. The students are looking forward to helping the Upper Graders with the tree house project in the forest, which was started this week. 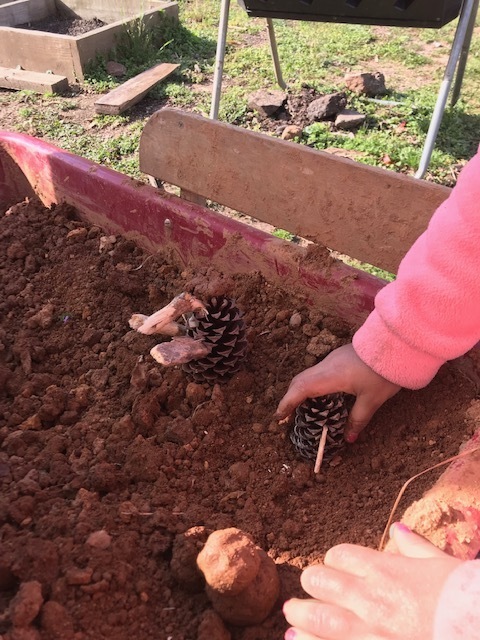 In the garden, students continue to excavate the soil looking for buried treasures. The students have really enjoyed spending more time with our animal friends. 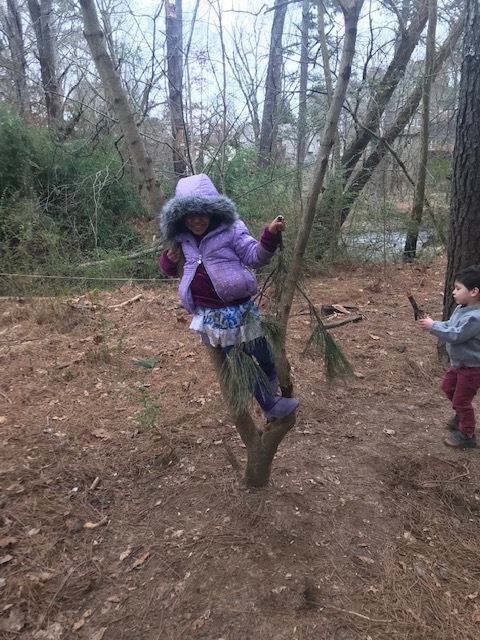 Typically, when we are in the forest our rule is “dry play” so that our Meadowgarteners can stay dry and warm throughout our morning time outside. 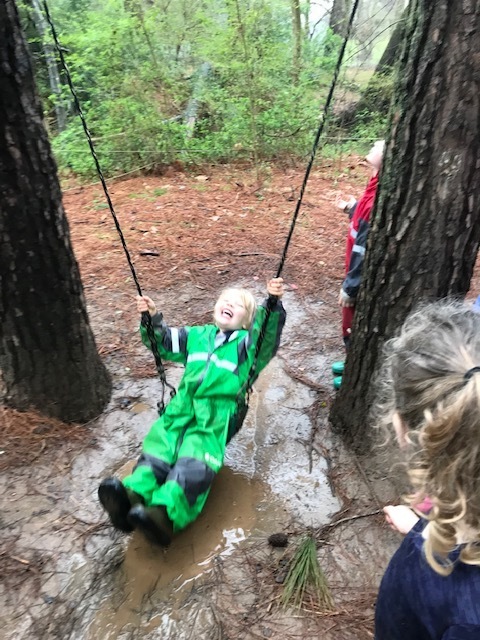 However, one morning was particularly warm and students found themselves migrating toward the large puddle at the bottom of the forest and when we saw how much fun they were having jumping in the puddle, we lifted the rule and encouraged wet play. 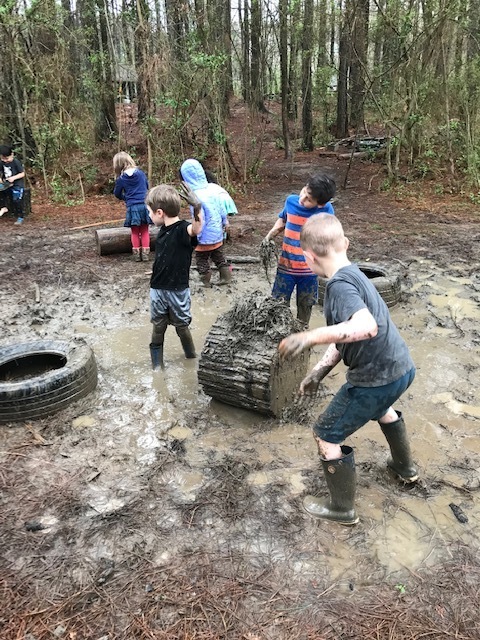 And they had a muddy, wet BLAST! We are starting to learn numbers in Mandarin with Ki Cerena. We enjoyed Mandarin out in the garden this week with the donkeys and goats as our backdrop. After Mandarin, the students devoured Ki Holly’s Famous Bread, as one of our students coined it, and huge, tasty oranges. We are looking forward to some basic work with hammers next week out in the forest and we will also start kneading some dough! We have asked the Joyful Beginnings class to join us on Thursdays for soup starting next week. 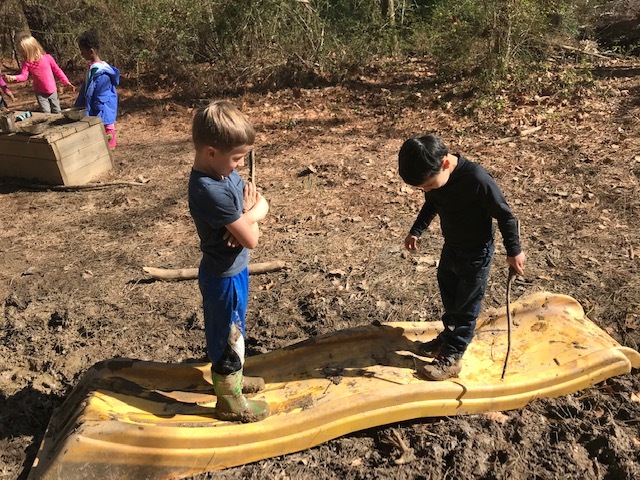 Even though the forest is starting to dry out, there is still a large amount of mud so please continue to send waterproof boots and a change of shoes. Last week we experienced some chilly mornings again but warmed up by the fire and by the afternoon shed our layers and enjoyed the warm Spring sun. The children have been thoroughly enjoying foreign language. They are now learning the numbers in Mandarin and have picked it up very fast! We were excited to see the sprouts from our tomato seeds and the newly blossomed daffodils and tulips in the garden. We saw some interesting objects during show and tell including a beautiful drawing of a giraffe, a special stick, crystals, and one of our children’s first tooth that had fallen out! On Friday we made our pizza together and had a pizza feast. Outside we enjoyed chamomile tea. We have had fun (and cold!) weeks in the Meadowgarten last week. Due to the icy temperatures in the mornings, we spent a bit more time inside our classroom. We enjoyed Tuesday and Thursday as Sungarten, spending the entire day with our Mountain friends. On Tuesday, we enjoyed Spanish class with our new teacher Ki Paulyna! We received seedlings from Ki Kathee and we will watch them sprout in our classroom before sending them home for the weekend. Please take care of the seedlings over the weekend and bring them back on Monday so that we can plant them in our garden bed. We spent a lot of time with our animal friends this week in the garden, which the Meadowgarteners greatly enjoyed. 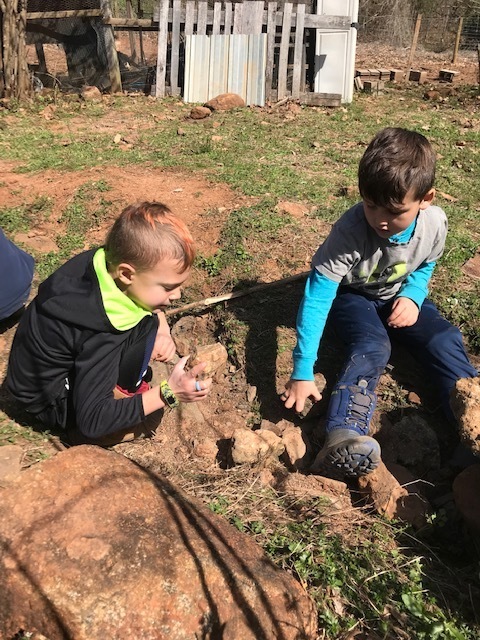 In the garden, students enjoy climbing on the dome, pulling the mud filled wagon from place to place, crossing the student-built bridge to the area where they are digging for dinosaur bones, and finding slugs and earthworms below the many rocks that live there. We celebrated dear Luna’s birthday and enjoyed delicious banana bread as a treat! We also celebrated Lochlan’s birthday with some strawberries and coco whip! We are so thankful to the Upper Grades students for sharing their Trojan Horse fort with us that they built themselves. 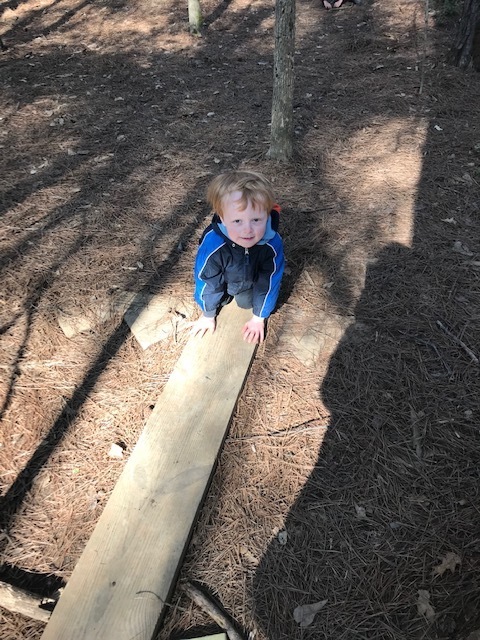 They led us into the forest and talked to us about the structure and each Meadowgartener had a turn climbing the steps and hanging out in the fort. It was so much fun! The forest is still very muddy. Please remember to send your Meadowgartener with appropriate footwear for forest play. Rain boots or other waterproof boots are the best option to keep their feet dry and warm as they splash and play. Our past few weeks have been very cold, which lead to a lot of indoor play. This allowed for our moon children to get a chance to play with the toys in the classroom. 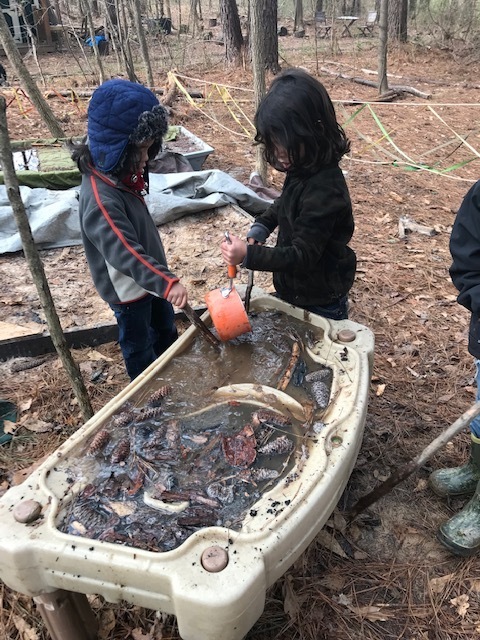 While outside, the children dug deep holes in the garden looking for fossils, and they made an ice work area where they would take the ice that they found and smash it. The children were able to enjoy Spanish and Mandarine. The children have really begun to enjoy Mandarine as they are interactively participating in the activities that are given to them by Ki Cerena. We’ve celebrated Nina, Julian, and Oliver’s birthdays too! We had yet another fun (and muddy!) week in the Meadowgarten. The week started off sunny and warm. The forest was busy with activity as always. Two students discovered how to make music in nature, hitting sticks against a fallen log. Both Meadow and Mountain students worked together to create a large pile of supplies, in hopes of building a tree house in the near future. Everyone enjoyed squishing their boots in the mud and the mud kitchen was as busy as ever with a vast supply of muddy water for all of their bakery delights. The students enjoyed making birdfeeders this week. We cut mandarin oranges in half, ate the inside of the orange and used the peel as a cup to hold the birdseed. Some of the feeders are hung by the playground and others are in the forest. We are excited to see the many birds they will attract! We did a brief introduction to finger knitting this week and we will introduce it more formally over this next week. The students were very excited to work with yarn and a few were able to bring home a piece of their work. We will continue to build this skill until all of the students are comfortable with it. We enjoyed Creature Feature on Thursday, which was presented by our very own Christopher Sanchez and his mom, Erin. The students were able to pet Christopher’s tortoise and bearded dragon. They learned a lot of valuable information about these wonderful animals! We are thankful to the Sanchez family for sharing their beloved pets with us! First Friday assembly was wonderful as always! The Meadowgarten did a fantastic job reciting our new Spring Verse and singing Sol Solesito in Spanish. We were very proud of them! As always, thank you for sharing your children with us. We love watching them grow and play each day! 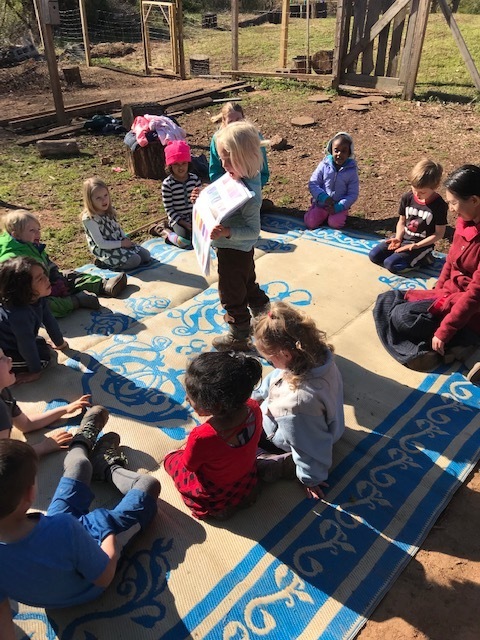 We welcomed the week with three new Spring songs for our morning circle, by the time Friday came around, the children were already partially singing and following along with the movements. A big thank you to Erin Sanchez for bringing in the tortoise and bearded dragon for Creature Feature, it was a lot of fun to see them up close and to touch and feel the texture of their skin. We had a great turn out for Friday's Show and Tell. We looked through a book about sharks and tried to name as many as we could, we touched a beautiful crystal heart, giant pine cone, various stones, and a coin. One child brought in her very impressive mermaid painting, and another child brought in his finely crafted sock caterpillar, we also listened to a couple of sweetly sung songs! Friday's assembly was also a joy to watch. Our Mountaineers did a wonderful job singing "Yonder Come Day" and a song in Mandarin. We loved the new addition of the Parents chorus too, it sounded so beautiful and in harmony- thank you! We are excited to start the seeds that were gifted to us by Ki Kathee's class, we are hoping to get our hands in the garden this week! We are excited to return back to school this week! Although our days were cut short the week before our break, they were full of good experiences and play. We enjoyed the Gilgamesh play and were so impressed by everyone's good work and memorization skills! We were especially excited that our Golden Knights had a part in it as well, and they seemed to especially love being clad in white. We celebrated Clarke's birthday and loved hearing his amazing birth story. Thank you Elizabeth and Dominic for being present and for the delicious treats! Thank you to all who prepared sweet Valentine's day surprises to place in the children's bags. Another special and furry surprise joined us in the forest as well. Ki Sonya brought her sweet pup who was so gentle with the children. They loved to touch her soft, white fur. Thank you Sonya. A special thanks for taking time out of your day and joining us for parent teacher conferences, it was nice for us to meet again and discuss your child's progress and happy to hear they are happy at school. We greatly enjoyed speaking with all of you about your wonderful children the week before break. We hope that you are happy with the information you received during conferences. Please do no hesitate to contact us with any questions or concerns moving forward. The half days always seem to fly by so quickly! 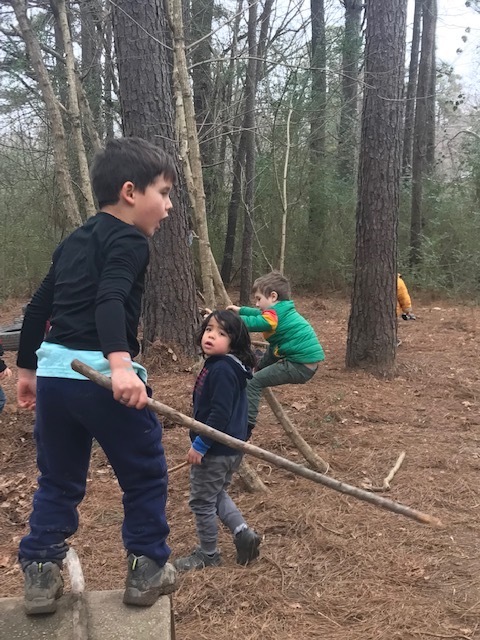 We spent the whole week outside in the forest, keeping up with all of the wonderful activities that the children love so much. Ki Serena called on volunteers to lead the color song during Mandarin class and we practiced our Sol (sun) song in Spanish class. Our story this week was Stone Soup and the kids had so much fun telling Ki Holly what ingredients to add to the soup. The Meadowgarteners had a lot of fun with our real soup snack this week as well. We added a bean medley in with our veggies and we were guessing what types of beans we were eating. We found lima beans, chick peas, black beans, great northern beans, split peas and many more! 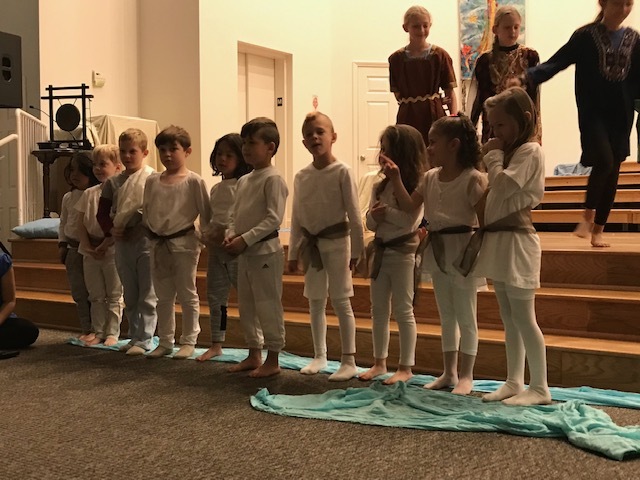 We really enjoyed seeing the play “Gilgamesh” that was performed by the Upper Grades and our very own Golden Knights. It was a very impressive performance by all! We hope that everyone had time to relax and spend time with family and friends over the break and we are very excited to be back to school! 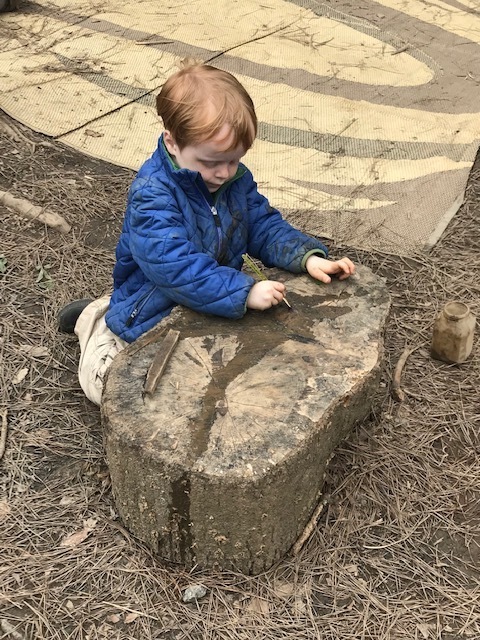 The weather looks mild in the week ahead and we can’t wait to start doing some arts and crafts and other practical work outside at our forest base camp!